Wendy Everly knew she was different the day her mother tried to kill her and accused her of having been switched at birth. Although certain she’s not the monster her mother claims she is – she does feel that she doesn’t quite fit in . . . The fate of Förening rests in Wendy’s hands, and the decisions she and Finn make could change all their lives forever . . . 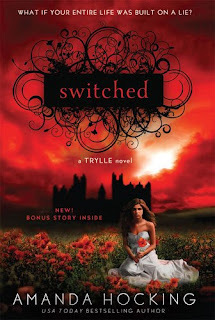 Switched is a bright beginning to Amanda Hocking's Trylle Trilogy! The republished edition of Switched is enhanced with new scenes and a faster pace in the plot. The story jumps right in by setting up the characters and their roles. Readers realize that Wendy isn't the average teen early on in the story, and don't have to wait long for confirmation. Amanda Hocking has a way with words. Having her characters say much in the span of a few words is a big part of why the plot of Switched moves right along. Wendy is a very subdued character, but readers will be able to feel her compassion and strength right underneath the surface. She's sarcastic and sometimes quick tempered, but she grows as the story continues. Wendy falls in love pretty easily, but it seems she'll have to fight to stay in love. Her relationship with her mother may very well be the highlight of the novel. Elora is hard and cold, the complete opposite of Wendy, so it'll be something to watch the relationship evolve in the series. The story ends at just the right place. There are no loose ends, though readers may be struck with a case of severe curiosity. The never-before-published short story, The Vittra Attacks, somewhat fills that curiosity while, at the same time adding more depth to the Trylle and Vittra societies. Switched is an amazing beginning and Torn is bound to be just as delightful!